A significant turning point for the US stock market was reached in Q3 2016 with the return of positive year-on-year growth in US corporate profits. The long-awaited return of Australian earnings growth may be happening too, based on a recent research report by Deutsche Bank's Australian equity strategy team. The Australian consensus EPS growth forecast for FY17 sits at around 9% and has actually been upgraded in recent months. That sits in stark contrast to recent years (and the historical average) where downgrades are the norm. 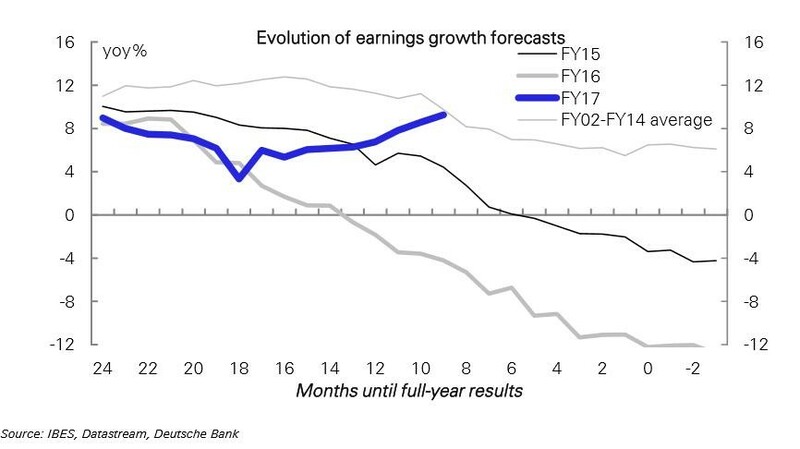 By this time in 2015 and 2014, forecasts for next year's earnings growth had already been cut in half (or more) after starting the year at around 9% (see the first chart). Downgrades to bottom-up EPS forecasts over the course of a year are fairly normal, with Pollyanna-like analysts prone to over-optimism. The average EPS revision profile for the period FY02 to FY14 can also be seen in the chart. It shows EPS growth nearly halving over the course of the average year. Occasionally though an upgrade cycle for market earnings can occur and, at the halfway mark for FY17, that appears to be happening. 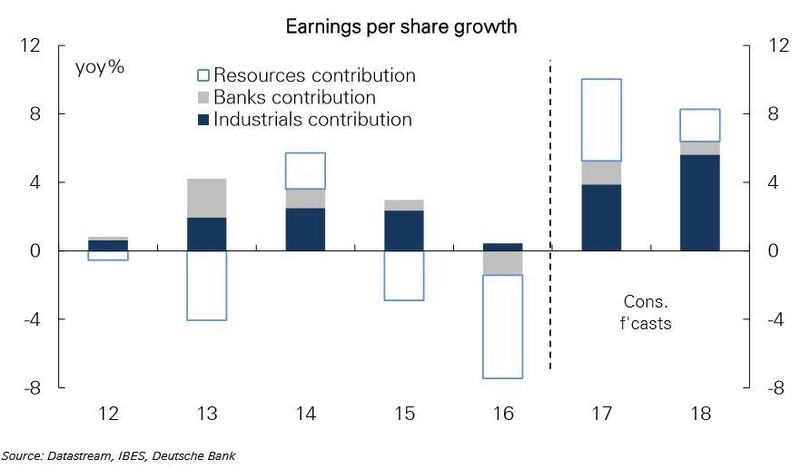 Excluding resources, earnings growth has actually been positive for several years (although FY16 was dragged down by Woolworths and a soft year for banks). That can be seen in the chart below. Resources is the key driver for the expected FY17 EPS growth, but modest EPS growth is expected to continue elsewhere. Whilst this is mainly a resources story, the return of overall market earnings growth should be positive for sentiment in general. It follows years of profit declines for resources with other parts of the market growing EPS, which should continue. Key indicators confirm the possibility of a better earnings environment ahead. The earnings revision ratio (itself a leading indicator) is a little above average, which is consistent with 5%+ earnings growth. DB has created its own "Profit Pulse" indicator for Australia, a composite of macroeconomic data. It recently rose to a 6-year high and points to earnings growth in the 5% to 10% range. The Profit Pulse indicator is an equally-weighted average of the US ISM index, NAB business conditions, growth in hours worked, credit growth (average of YoY growth & the credit impulse), real mortgage rate, exchange rate (average of level & YoY change) and commodity prices (two-thirds weighted to mineral prices & one-third weighted to the oil price), with all variables standardized over their history. Most of the improvement in DB's Profit Pulse indicator has come from global drivers, in particular commodity prices and US economic data. Most of the domestic drivers are experiencing poor momentum relative to the past year. It is quite possible that the EPS forecasts for the more domestically focused companies will need to be downgraded from current levels. DB's strategists recommend being overweight miners to take advantage of the earnings upgrade cycle. They also recommend having US-facing exposure, given that the US ISM index is at an 18-month high and President-elect Trump's planned fiscal stimulus should be supportive. DB particularly likes Aristocrat Leisure (ALL), Amcor (AMC) and Macquarie Group (MQG). DB also screened for stocks with (1) accelerating earnings growth into FY17, and (2) earnings upgrades. Stocks that screen well on those criteria include Rio Tinto (RIO), South32 (S32), Suncorp Group (SUN) and Fletcher Building (FBU), according to DB. Maybe this time it is the real thing but for share investors the effects are likely to be felt unevenly.